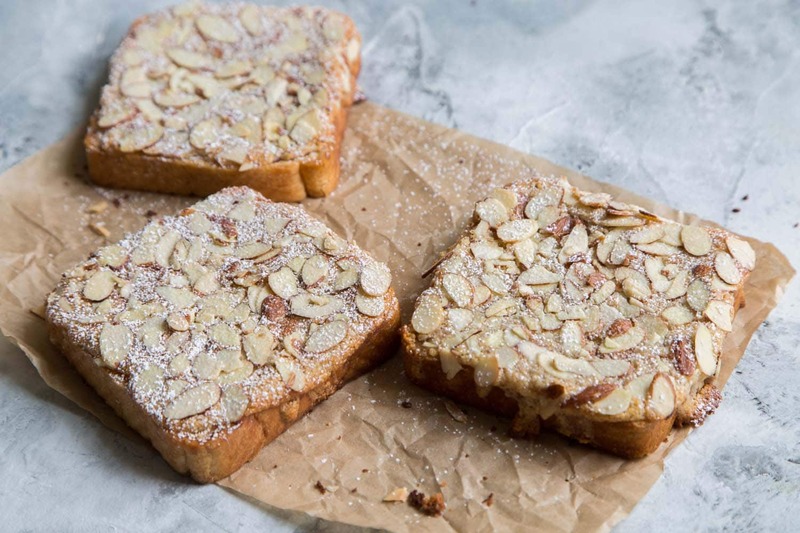 Almond bostock, also known as brioche aux amandes (almond brioche), can be best described as a cross between French toast and an almond croissant. Hello 2018! I’m ready for breakfast and I want almond bostock. I ended the last week 2017 with a flu. While it doesn’t sound fun, it was a blessing in disguise. 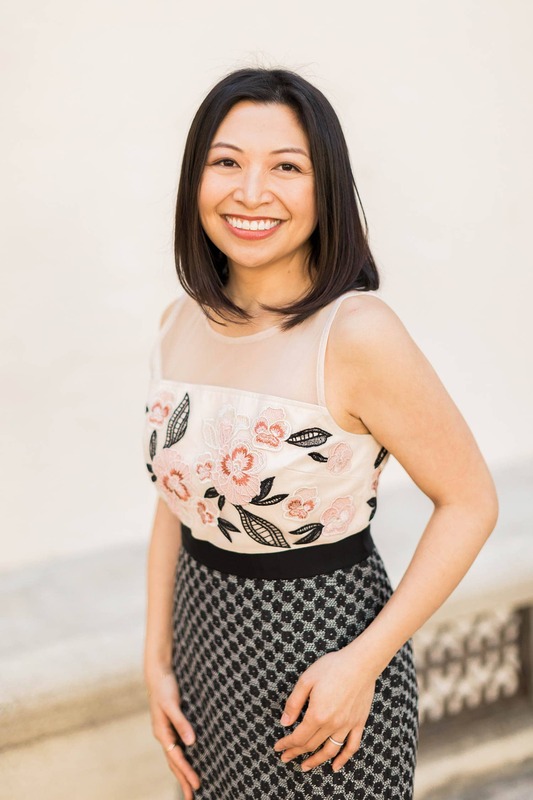 I was able to unplug from the blog, social media, and the world and simply stay in the bed and sleep. I slept for what seemed like days and lived on soup and warm beverages. Now that I have fully detoxed, it’s time for something sweet. 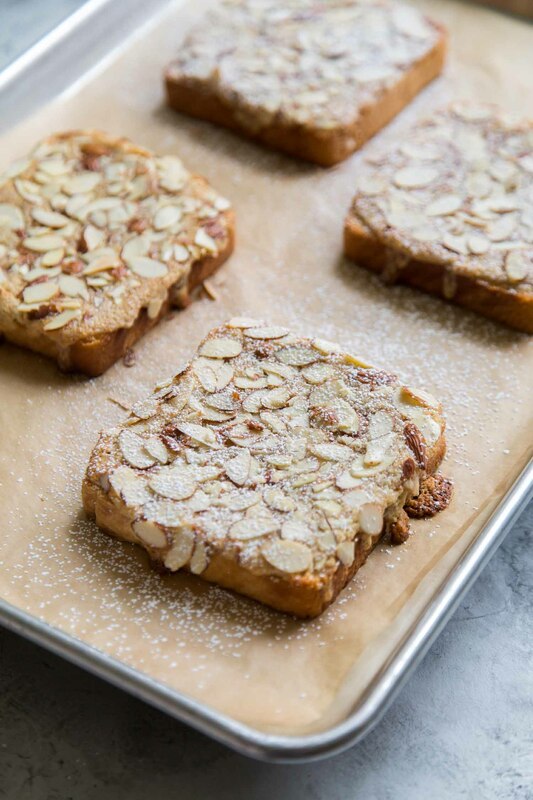 Almond bostock, also known as brioche aux amandes (almond brioche), can be best described as a cross between French toast and an almond croissant. There are numerous variations on this buttery, crunchy breakfast treat. Bostock is usually made with a thick slice of day old brioche bread. It also works well with challah or other enriched white breads like Japanese milk bread. The bread is lightly soaked with simple syrup and topped with almond frangipane (or almond cream). It is covered with sliced almonds and baked. You can use all sorts of different flavored simple syrups, jams, fruit preserves, or spreads , however, one constant among all bostocks is the the thick enriched bread used. It is crucial to use a thick slice of bread. The bostock bakes crisp on the outside and remains a bit soft and custard-like in the center. That contrast is what makes this breakfast pastry so delicious. The almond frangipane spread can be made in advance and stored in the fridge until ready to use. The spread will harden in the fridge. Allow it soften and come to room temperature before use. Stir up the spread until it is soft, pliable, and creamy- otherwise, you’ll have a difficult time spreading it on the soft brioche bread. Alternatively, you can also dollop cold bits of the almond frangipane. It will spread and melt as it bakes. Frangipane is a creamy filling made with almonds. It is used to fill various pastries, tarts, and other baked goods. Frangipane is made by combining ground almonds with butter, sugar, and eggs. Since I like my frangipane with a little extra almond “flavor”, I add a touch of pure almond extract. I also added vanilla and orange zest for an extra dimension of flavor. It adds a nice freshness and liveliness to to this otherwise sweet and decadent treat. 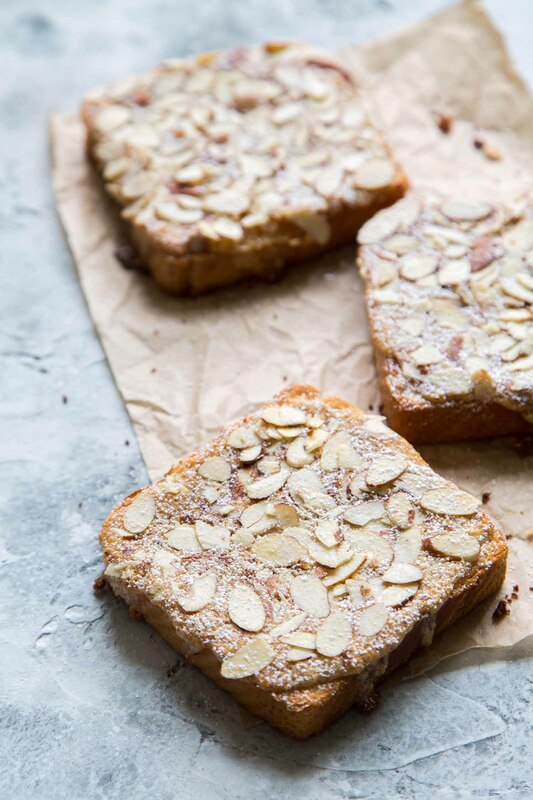 This orange almond bostock is a favorite in my house and I foresee many variations coming soon! Preheat oven to 350 degrees F. Line baking sheet with parchment paper or nonstick silicone mat. Arrange bread on baking sheet. Spread 1 tablespoon of orange marmalade over bread. Top with 3 tablespoons of almond frangipane spread. Sprinkle sliced almonds on top. 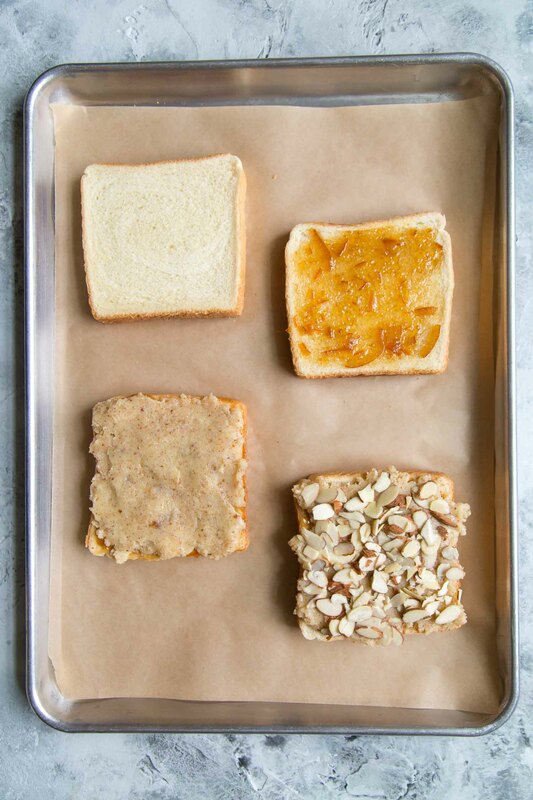 Bake for 12-15 minutes until almonds are golden and bread is toasted. Transfer bread to cool rack to prevent bottom from getting soggy. Dust warm bostock with sifted confections' sugar. Serve warm or at room temperature. In a food processor, pulse together almonds and half of sugar until nuts are finely ground. Transfer to a small bowl. In same food processor, process together softened butter, remaining sugar, salt, vanilla, almond extract, orange zest, egg, and milk until smooth. Scrape down bowl as needed to ensure thorough mixing. Add ground nut mixture and pulse until thoroughly combined. Use almond frangipane spread immediately, or store in an airtight container in the fridge for up to a week. Allow to soften to room temperature before use. In place of orange marmalade, feel free to substitute any fruit jam or preserves. I have had great success with apricot preserves and blueberry jam. You can also omit the marmalade and simply top bread with almond frangipane spread. If making almond frangipane ahead of time, allow it soften and come to room temperature before use. Stir up the spread until it is soft, pliable, and creamy- otherwise, you'll have a difficult time spreading cold frangipane on the soft brioche bread. Alternatively, you can also dollop cold bits of almond frangipane. It will melt and spread in the oven. Just made your Bostock recipe! Yay! Never have to buy a 5 dollar slice from my neighborhood bakery again! Awesome! That’s great to hear! Glad you enjoyed it!